It’s been a busy couple of weeks for faith-based organizations in San Francisco. On Monday, NPQ reported on the settlement of a dispute between Third Baptist Church and a nonprofit subsidiary, and last week NPQ featured a story about the Fraternite Notre Dame Mary of Nazareth Soup Kitchen’s losing the lease to the store where they live and serve their homeless neighbors. The dramatic increase in rents in San Francisco is at the root of the problems. The present political climate of profit over people continues to devastate the African American population of the Fillmore, leaving the “Coltrane Church” to stand alone as the sole historic proprietors of the music and culture of jazz as a means to enlighten. The managers of the West Bay Conference Center are seeking to DOUBLE the amount of our rent and our lease is up, leaving us with our backs against a wall. The SJCAOC affiliated with the African Orthodox Church denomination in 1982. The denomination was founded in Chicago in 1921 by a group of African Americans as an offshoot of the Episcopal Church and has evolved to embrace a wide range of religious practices and beliefs in the U.S., the British West Indies, and Africa. 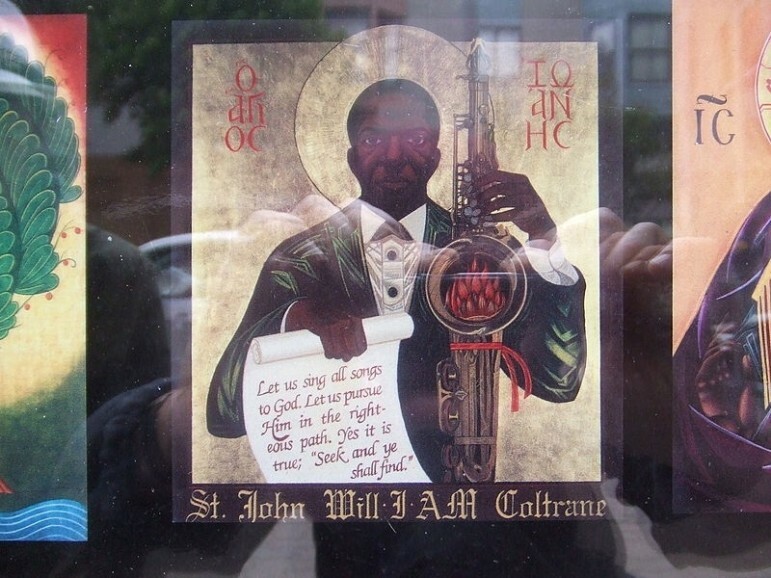 It’s entirely appropriate for the AOC to canonize John Coltrane, one of the 20th Century’s most important jazz musicians. Like most of his peers, Coltrane was “raised in the church” and by all accounts had a fairly traditional relationship with the church that led him to his best-known spiritual expression, A Love Supreme, recorded in 1964. However, just a year earlier, Coltrane recorded Crescent, a tribute to Islam, and between 1963 and 1966, he recorded Selflessness and Om, both nods to his wife, Alice Coltrane’s, embrace of Hinduism. In the final two years of his life, Coltrane recorded purely African music like Kulu Sé Mama. SJCAOC could not be a better memorial to the spiritual legacy of this landmark African-American musician who died of liver cancer at the age of 40 in 1967, nearly 50 years ago. While the SJCAOC is fighting for its institutional location in the Fillmore, Coltrane’s childhood home in Philadelphia and the John Coltrane House in Dix Hills on Long Island are charities seeking support for preservation and restoration of a physical landmark. Neither of the Coltrane homes sponsors regularly scheduled musical events. At SJCAOC, Coltrane’s music is a part of a liturgy every Sunday. And that could be a barrier to the SJCAOC finding sufficient funding to maintain its present location. The church doesn’t quite fit into the charity landscape, since it has elements of a neighborhood landmark, a performing arts venue, and a church. Then, too, the attitude of the Church founder, Archbishop Franzo King, seems not as “warm and fuzzy” as the nuns who run the soup kitchen that was rescued by Tony Robbins following publicity about their impending displacement. Archbishop King’s approach seems much more like the leaders of Third Baptist Church in its struggle to preserve an affordable housing development: Win in the court of public opinion!